Compact wallet design with velcro closure. 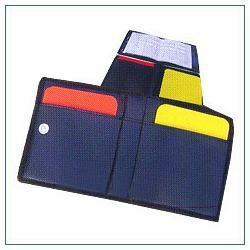 Includes 2 referee cards, referee notebook pencil. 2 referree cards in a rexine pouch. New design, with referee notebook. - It is a handy storage case with zipper closure. - It includes referee cards, small note pad, match notes, whistle, lanyard, pencil, pen, coin & eraser. Available in PU leather and PVC synthetic. Contains all that a ref.needs on the field. 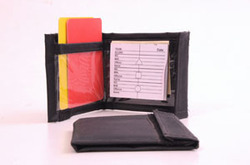 Wallets made for referees, to hold their cards, note pads and other game related necessities. Designed to be simple and easy to use during games.